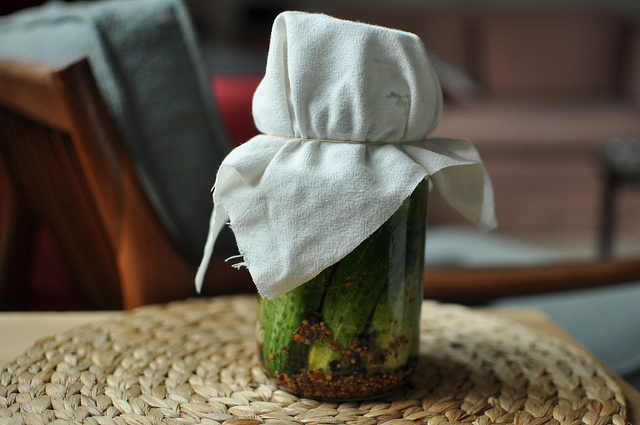 We’ve been hearing a lot about fermentation recently, and for a good reason. Fermented foods are linked to a slew of health benefits ranging from improving digestion to providing the body with important nutrients. Sauerkraut is probably the best known fermented food, but other fermented foods include kombucha, kimchi, yogurt, vinegar, leavened bread, miso, tempeh, and even chocolate is made with fermentation. Fermentation is the process of introducing bacteria or yeast into a food. The bacteria or yeast then turn the sugars into a new substance. For example, when yeast is added to juice, it will turn into vinegar or wine. Before the era of refrigeration, fermentation was popular because it was the only way to extend the life of foods. The history of fermentation goes back at least 8000 years to Georgia (the country, not state) where there is evidence of wine production. We usually think of bacteria as something of which we must rid ourselves. However, gut bacteria (aka gut flora) is actually incredibly important for everyday health. There are approximately 100 trillion bacteria living in the intestines. To give you an idea of how vast this number is, it is more than 10 times the number of human cells! Researchers are just now beginning to understand the many functions of gut bacteria in the body. However, it is clear that the bacteria act much like an organ (In an EMBO report, researcher Ann O’Hara called gut flora the “forgotten organ.”). Gut bacteria plays a role in cell development and boosting immunity. The healthy bacteria fight disease by killing off unhealthy bacteria and fungi (hence why probiotics are a woman’s best friend during a yeast infection). Bacteria can help protect against colon cancer, reduce diarrhea, and fight bowel disease. Recently, gut bacteria has gotten a lot of attention as a potential cure for obesity. Doctors are even performing gut bacteria transplants with success. One study which was published in the journal Science Translational Medicine found that mice which were given transplants of gut bacteria lost 5% of their body weight. Other studies show that mice in sterile environments consistently gain weight. Researchers are still far from completely understanding the complex roles of gut bacteria in our body – but it is clear that we need this bacteria to maintain healthy lives. The degree to which our bodies can absorb a substance is called bioavailability. There are numerous factors which affect bioavailability, such as the presence of other nutrients or a person’s age. For example, the iron in whole grains is said to have a low bioavailability. This is because whole grains also contain high amounts of the nutrient blocker phytic acid which inhibits iron absorption. Healthy bacteria provided by fermented foods can help break down nutrient blockers. The Weston A. Price Foundation found that beans which were fermented for 18 hours had their phytic acid content halved, thus increasing their bioavailability of iron. *I usually think that the WAP people are whack jobs because they preach things like eating copious amounts of saturated fat. But, since WAP is so obsessed with the idea of antinutrients in food, I actually trust them when they say fermentation improves bioavailability. Plus, this idea is backed by tons of other research. A study published in the journal Nutrition found that sourdough bread (which is made with fermentation) had a much higher bioavailability of iron as well as zinc and magnesium than unfermented whole wheat bread. Numerous other studies, such as those published in the Journal of Food Science and Intestinal Microbiology, show that fermentation also increases the bioavailability of calcium. For vegans, who are at higher risk of iron and calcium deficiencies, fermentation can play an important role in helping them get enough of these key nutrients. Vitamin K is a nutrient which gets very little mainstream attention. However, recent research shows that the vitamin may be very important for bone. Vitamin K comes in two forms: K1 and K2. Vitamin K1 is readily available in many plant-based foods. Vitamin K2 is produced in the body by gut bacteria. Research shows that vitamin K2 binds with calcium molecules and essentially shuttles the calcium to where it is needed in the body. Without enough vitamin K2, the calcium can’t make it to the bones, putting people are at risk of osteoporosis. This may be why osteoporosis is so unheard of in East Asia (where eating fermented foods is common), despite the fact that they don’t consume much dairy. If you are getting calcium without vitamin K1/K2, you may also be at risk of heart disease. Numerous studies have found a link between calcium supplements and heart attack and stroke. This is because, without K2 to take the calcium to where it needs to go, the calcium can harden in the arteries, leading to arthrosclerosis. 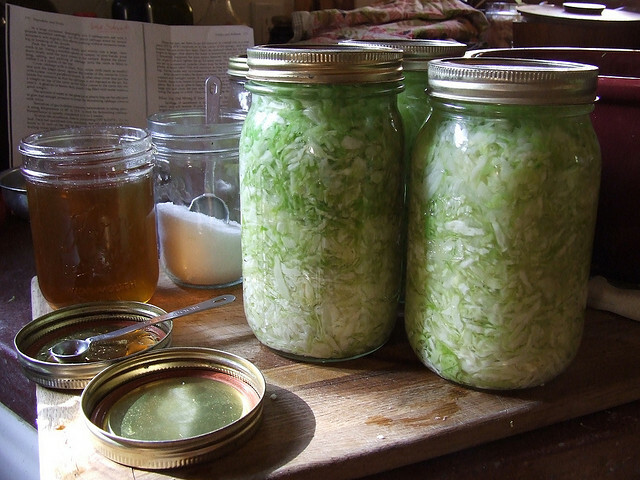 Fermented foods are a good source of vitamin K2. Read more on vitamin K2 here. I Should Go Buy Some Pickles and Sauerkraut – Right? For most of human existence, we were clueless about the existence of bacteria. We ate foods in their natural form – which meant consuming lots of bacteria in the process. By comparison, our lives today are remarkable sterile. We use antibacterial sprays, we wash foods before we eat them, and even fermented foods like beer and wine are routinely pasteurized before consumption. As a result, our bodies are lacking in the gut bacteria we need to stay healthy. Eating fermented foods is one way to get healthy bacteria into the gut. Unfortunately though, it isn’t as simple as going and buying some pickles and sauerkraut at the local supermarket. Most fermented foods found in the supermarket are made quickly by putting them in vinegar instead of the traditional method of fermentation which uses lactic acid. If you want to get the health benefits of fermentation, you need to look for products which are made with lacto fermentation. They will be found in the refrigerated section of the supermarket, NOT on the shelves! I knew that I needed to get started with fermentation, mostly because I was worried about absorbing enough calcium from my food (vegans, this is something you should be worried about, especially if your calcium is coming from fortified foods like plant milks and not from greens!). All those bloggers also talk about how “easy” it is to make your own pickles. I went online to figure out how to make my own pickles. I’ll admit it: I got friggin’ confused. Some bloggers insisted that you’ve got to cover the pickles, others said you’ve got to keep the open or the jars will explode. Yet others recommended special fermenting jars. Since we are working with bacteria here, you can understand why I was apprehensive to start fermenting! The one thing they seemed to agree on is that you’ve got to keep the pickles submerged in the brine so they won’t go bad. 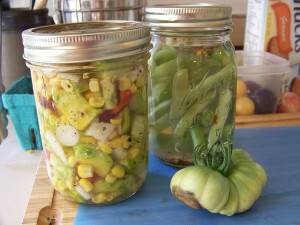 The best instructions for DIY pickling I found were from Michele Thorne (here). But, if you want more detailed instructions and advice, I’d recommend getting what is basically the Bible of Fermented Foods: The Art of Fermentation: An In-Depth Exploration of the Essential Concepts and Processes from Around the World by Sandor Katz. 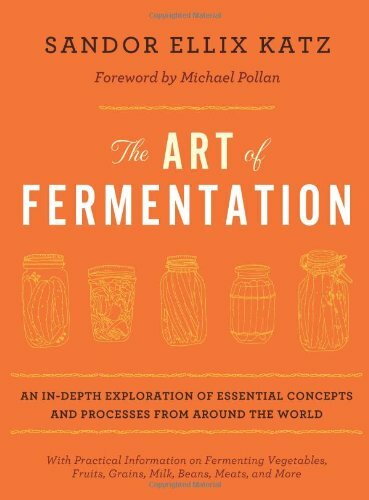 This is the book beginners will want because it discusses everything about fermentation – even getting into details like crock designs, gourds and other vessels for fermentation, and adding starters to vegetable ferments. 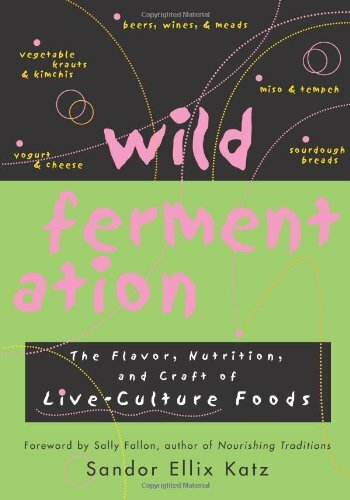 Sandor Katz also has this awesome book: Wild Fermentation The Flavor, Nutrition, and Craft of Live-Culture Foods which gets more into the health benefits aspect. It doesn’t have as much info about how to ferment, but has tons of recipes for veggie ferments, bean ferments, and dairy ferments (with vegan alternatives! ).